The traditional Christmas carol concert from King's College Chapel, Cambridge. Stephen Cleobury conducts the famous chapel choir in carols old and new. The traditional Christmas carol concert from King's College Chapel, Cambridge. Stephen Cleobury conducts the famous chapel choir in carols old and new, including Once in Royal David's City, In Dulci Jubilo, Ding Dong Merrily On High and Angels from the Realms of Glory. The story of the Nativity is told in the words of the King James Bible and in Christmas poems by Edwin Muir, GK Chesterton and Ben Jonson. 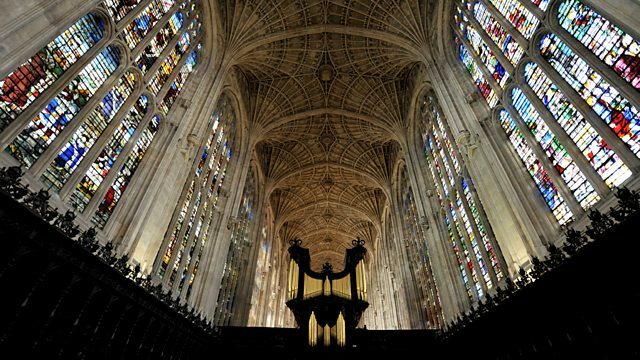 Hear Radio 4's coverage of carols and readings from the candlelit King's College chapel.